Charlotta Östlund (born 1973 in Sweden) combines things picked outdoors in nature with man-made materials. Their juxtapositions reveal the human aim of capturing the essence and beauty of nature. 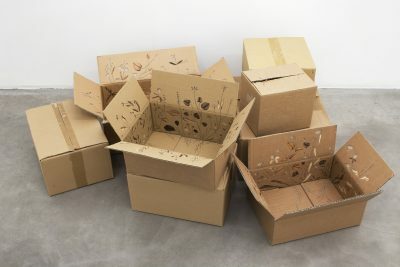 In Hidden Meadow, the imitation of nature is repeated in inlays made in cardboard boxes. Inlay technique is a demonstration of skill among cabinetmakers, involving finely executed ornamental designs made with hardwood veneers or stones of different colour on the surface of pieces of furniture. 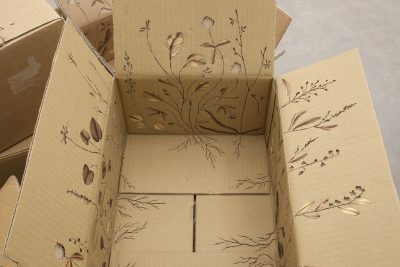 Östlund has executed plant motifs of flowers and their petals and delicate stems in wood inlay inside the cardboard boxes. Some of the parts hollowed for the inlays have been left unfilled and only the contours of the designs are visible. Nature imitated by man remains unfinished and incomplete. 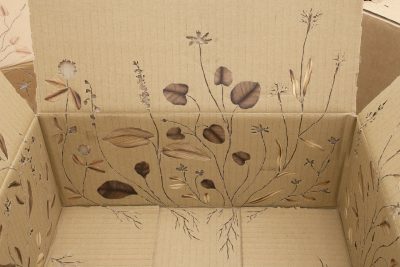 The use of a discarded used cardboard box as the ground for a time-consuming technique of decoration leads thoughts to momentariness. 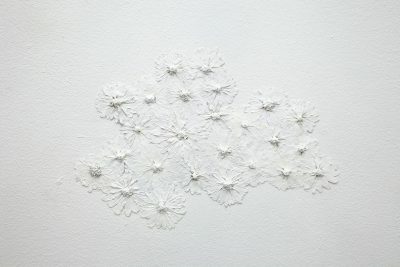 The other part of the work is a hidden weave of flowers. 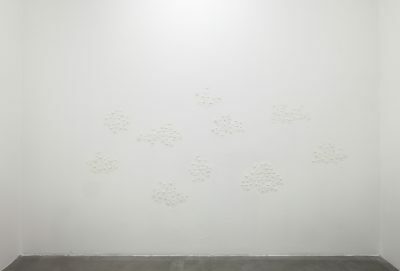 The wall is covered with petals as if they were floral wallpaper, but the real plants are hidden under a white coat of paint. Combining craftsmanship with discardable goods or the preservation of withering flowers within a wall are like attempts to halt time and to make something durable out of things that are transient. Living and working in Helsinki, Charlotta Östlund graduated from the University College of Arts, Crafts and Design (Konstfack) in Stockholm. Her recent exhibitions include the solo exhibition Toiveen hauras varsi –The Frail Stem of Hope at Galleria Huuto (2013) and the group exhibition Alone at the Helsinki Art Museum (2014 –s). Östlund has also made public works of art in Stockholm for the Einarskolan school and the Library of the Royal Institute of Technology.